In less than three months, the United Kingdom is set to leave the European Union. Martin Westlake writes that despite Brexit, internal and external forces are driving European states towards ever closer relations. The UK will remain an integral part of an ever-closer Europe, whatever the fine detail of its relations with the EU. The European continent is covered by a complex web of intricate mechanisms between states and organisations, many with overlapping membership. The continent is covered by a patchwork quilt – a patchwork of considerable variety, but a single quilt. If the UK leaves the EU it will not be leaving Europe. That would not only be a geographical impossibility; the UK will, in particular, remain a founder member of the Council of Europe (whose 1949 Statute declares the need for ‘a closer unity between all like-minded countries of Europe’) and a founder member of NATO. The UK will remain a part of the quilt. And the UK will certainly not be removing itself entirely from its relationship with the EU. As the detail of the draft withdrawal agreement already illustrates, by leaving the EU, the UK will instead be swapping one set of complex relations with the EU and its member states for another; but there will continue to be those complex relations, and there will still be the interdependence that such relations bring, from trade to scientific research, from energy to climate change. This will remain true, whatever the final detail of the future relationship, if and once it has been negotiated. The UK has always hovered on and about the perimeter of the EU version of the European integration process. Aloof at the beginning, in 1952 and 1957, by 1963 the UK was knocking on the door, and by 1973 it was in. By 1975 it could already have left through a ‘should we stay, yes/no?’ referendum (held just two years after it had joined) and, if Michael Foot’s Labour Party had won the General Election in 1983, the party’s manifesto promised that the new government would immediately open negotiations with the then EEC in order to prepare for the UK’s withdrawal – without recourse to a referendum. Over the forty-five years of the UK’s membership there have been difficult periods in the relationship. There were Margaret Thatcher’s repeated demands at European summits before she won a budgetary rebate at Fontainebleau (1985). Significant low points would also include: ‘Black Wednesday’ (1992), when the UK government was unable to keep the pound above its agreed lower level and was forced to withdraw it from the European Exchange Rate Mechanism; John Major’s 1996 policy of non-cooperation in the wake of the BSE crisis; and David Cameron’s 2011 veto of a proposed fiscal compact to shore up the euro. High points in the relationship would include Margaret Thatcher’s championing of the 1986 Single Market project, Tony Blair’s (albeit ill-fated) 1997 commitment to the single currency and the 2005 Blair-inspired informal European summit at Hampton Court, when a for once entirely pro-active UK presidency generated a raft of positive reform proposals (on, for example, energy policy and climate change). Cumulatively, the UK has given the impression of being semi-detached. But, with the benefit of hindsight, historians will probably identify the 1989 fall of the Berlin Wall as the critical turning point for the UK/EU relationship. French strategic diplomacy saw economic and monetary union (EMU) as the quid pro quo for German unification. The UK’s counter-proposal of a parallel currency never won support. Instead, John Major won a unilateral opt-out which, in 1992, with a Union of just twelve member states (euro-sceptical Sweden and Denmark, the latter with an opt-in, amongst them) and the Maastricht Treaty’s EMU provisions looking over-ambitious, must have seemed like a good rear-guard defensive bet. But the 1995, 2004 and 2007 enlargements added a mass of new member states which, through their membership, were committed to respecting the Maastricht convergence criteria and adopting the euro when they could (Britain, always a major proponent of enlargement, seemed not to have foreseen this consequence). Having made his commitment to a referendum, Cameron returned to these concerns when negotiating his 2016 New Settlement for the United Kingdom within the European Union. The Settlement, which fell with the June 2016 referendum result was, as Sir Ivan Rogers, former UK permanent representative to the EU has recently described it, ‘the last attempt to amplify and entrench British exceptionalism within the EU legal order.’ This episode illustrated once again the lengths to which the EU was prepared to go to accommodate the UK and acknowledge its exceptional status. But it is a moot point as to whether that exceptionalism could have continued indefinitely. Perhaps, in the longer run, the UK would have been faced with a binary choice – either joining the currency union, or leaving the European Union. Perhaps Denmark and Sweden may ultimately face a binary choice. Denmark, which won an opt-in right in the 1992 Maastricht Treaty, held a referendum on euro membership in 2000. Membership was rejected then, though there is recurring talk of a second referendum. Sweden, on the other hand, has no opt-out or opt-in and is theoretically obliged to prepare for membership of the single currency. However, membership was rejected in a 2003 referendum and though the country’s mainstream parties all favour membership, the country is currently making no preparations for entry. The absence of the UK and its exceptional status outside the eurozone will, in any case, put pressure on these countries to reconsider their relationship with the euro at some stage. Looked at from the perspective of the European integration process, the UK is just one, albeit an important one, of a number of European countries hovering on or about the perimeter and with whom relations require special attention and more-or-less special arrangements. If the decision had been left to its parliament, Norway would have joined the EEC alongside the UK, Ireland and Denmark, in 1973. Its government had even signed the accession treaty in readiness. A second referendum in 1994 confirmed majority popular opposition to membership, leaving Norway in EFTA and the European Economic Area (EEA). Iceland blew hot in 2009 and applied for membership, but blew cold in 2015 and ended its application process, remaining instead in EFTA and the EEA. Switzerland, with its complicated political and constitutional mechanisms, applied for membership in 1992 but suspended negotiations later the same year. It has had a continuously fraught relationship with the EU based on a myriad of bilateral agreements, many requiring frequent re-negotiation (the whole basic relationship is currently under review). And Switzerland is in EFTA but not the EEA. When it comes to the Schengen area, Iceland, Liechtenstein, Norway and Switzerland are all effectively members, though none are EU member states, whereas Bulgaria, Croatia, Cyprus, Ireland, Romania and the United Kingdom are not, though all are EU member states. Within the European Union’s immediate neighbourhood are the five candidate countries – Albania, Macedonia, Montenegro, Serbia and Turkey. As the EU’s General Affairs Council noted in June 2018, “Turkey has been moving further away from the European Union. Turkey’s accession negotiations have therefore effectively come to a standstill.” But the same Council also noted that, “Turkey remains a candidate country and a key partner in many areas.” All five candidate countries are members of the Council of Europe. Three – Albania, Montenegro and Turkey – are full NATO members, whilst Macedonia and Serbia are partner countries (and Macedonia is about to become a full member). Beyond these, the European Union’s over-arching Neighbourhood Policy, its stabilisation and association process, and the Barcelona (Euro-Mediterranean) Process seek to manage the EU’s relationships with countries such as Algeria and Morocco (in 1987 the latter even applied for EU membership – an application rapidly rejected on the grounds that Morocco was not a European country) to the south and Armenia, Georgia, Moldova and Ukraine to the east. Space precludes more detailed coverage of all aspects of the patchwork quilt, but some of the more notable recent developments would include the EU’s 2017 Global Strategy for the European Union’s Foreign and Security Policy, the EU’s 2017 integrated policy for the Arctic region (a perimeter directly involving three EU Member States – Denmark, Finland, Sweden – but also the EFTA/EEA states, Iceland and Norway) and the 2017 Permanent Structured Cooperation (PESCO) in security and defence, involving 25 of the current 28 EU member states (excluding Denmark, Malta and the UK). Analysing relations with the Russian Federation which, like Turkey, has most of its landmass in Asia, would also require more space than is available here. Already, in March 2018, 49 of the African Union’s 55 member states signed an agreement to create an African Continental Free Trade Area (AfCFTA) which, if ratified, will represent the largest free trade area in the world in terms of participating countries since the creation of the World Trade Organisation in 1995. 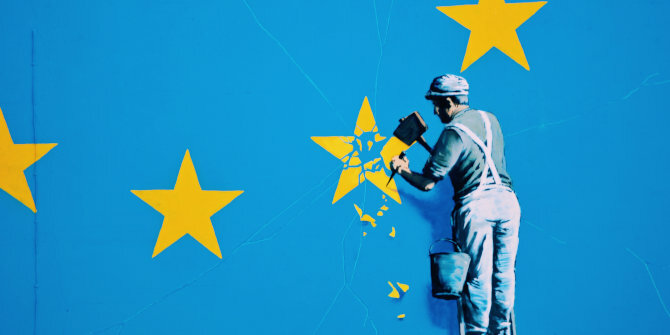 Seen from these perspectives, the Brexit process is a distraction, a diversion, albeit painful and traumatic, but one that will almost certainly be subsumed in the overall trend towards greater integration. For the only way Europe can continue to punch its weight in the world is by pulling together. It was no idle boast when Juncker declared in the same speech that the EU’s “global trading position is the living proof of the need to share sovereignty. The European Union now has trade agreements with 70 countries around the world, covering 40% of the world’s GDP.” The EU is, as Sir Ivan Rogers put it in an earlier speech, ‘a regulatory and trade giant.’ As the Union seeks to embrace the whole African continent in a trading partnership it would be a great irony if the mercantilist UK were to deny itself the trading opportunities such a partnership would create and which it would probably be unable to negotiate on its own. In any case, taking the longer-term view, the UK may become more or less semi-detached but, in one way or another, it will remain attached to the European continent’s only viable survival strategy in a rapidly evolving world. Martin Westlake is Visiting Professor in the Department of European Political and Administrative Studies, College of Europe, Bruges, Senior Visiting Fellow, European Institute, and David Davies of Llandinam Research Fellow, Department of International Relations, London School of Economics and Political Science. Europe needs pulling together, indeed. That’s why it is absolutely essential that the EU federalisation project is abandoned asap. This is not the time to start a Europe-wide civil war. The EU itself, moreover, cannot be saved. It is quite beyond being reformed. It is a 19th Century skeletal project with a 20th Century mindset and overlay. The EU and its powermongers cannot help being what and who they are. All the EU operatives can do is play their game to the bitter end, by which time Europe needs to hurry te ready itself for bare survival. With a raised eyebrow at the unwelcome nod to “ever closer union” of the Treaty of Rome …..
… few Brexit supporters have the slightest problem with “closer relations” with pretty much any country. The article seems to object to “patchwork quilts” and a complex web of “bi-lateral relationships” – all coming across as offending an orderly bureaucratic mindset. … to remove the UK from being subject to thousands of internal, domestic laws from foreign bureaucrats and politicians ( who UK voters cannot remove ) those laws being subject to a foreign supreme Court. “Closer relations” are very welcome – as long as the UK is able to agree (or not) to each and every proposal – or implement a variant. …. and coalesces around converging standards through the hundreds of trade-bodies (often based in Geneva). Xenophobia and the idea of nation or community are all relative over time. The UK was ‘invented’ a mere 3 centuries ago, and earlier still consisted of various small entities, eg Mercia. With fast travel and global trade Europe in turn has become a family of sorts. It is false to claim that norms and regulations are imposed, as the UK had a seat at the table and sometimes veto rights. The alternative to Europe is what? And with respect to Africa’s increasing importance, the future may well lie in a revival of the old Eurafrica plans, criticised as neo- capitalist it is true, but it is up to African nations to ensure that such schemes benefit both sides, just as semi- free Greenland is playing Europe, China and others against one another to get the best deals. If it were only about norms and regulations Brexit would not have become a choice for 52% of the vote. The EU has been rubbing people up the wrong way for a long time. Ever since the referendum in the UK was called, the EU leadership has shown most unstatesman-like behaviour. Whatever happens, Europe will still be there. What its peoples will do or not do and put up with remains to be seen.